You guys, I have to tell you about these bars. 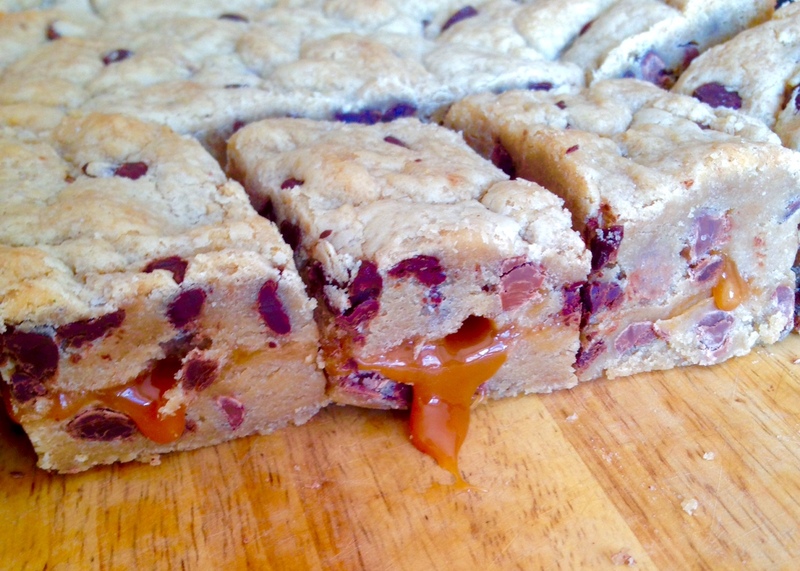 I’ve been making them for a couple of years now and I might even go as far as to say that they are my favorite bar dessert, ever. You’ve seen how much I bake, so that’s pretty bold of me to say, but these babies deserve the praise. Most recently, they were part of the Thanksgiving desserts I made, along with Rhubarb Cake and Pumpkin Layered Dessert. All of the desserts went over well but these were what everyone went back for seconds and thirds of, and were the first to disappear. I can’t blame anybody for wanting more, either. These are thick, chewy cookie bars loaded with chocolate and garnished with a light sprinkling of sea salt. 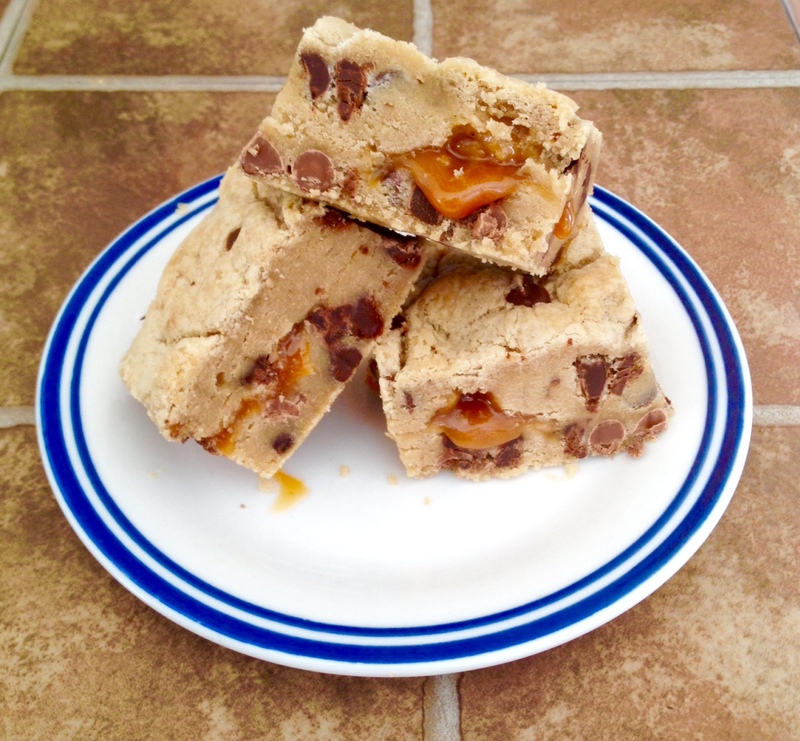 In the middle of all the chocolate chips and cookie dough is the ooziest layer of salty caramel. They are TO DIE FOR. I’ve had people tell me they were stuffed and couldn’t eat another bite, but try one anyway and then take a second. They are worth the discomfort, I promise you; everybody will fight over the last one. Preheat oven to 325 degrees. Line a 9×9 inch square pan with parchment paper and set aside. In a medium bowl, mix together the flour, baking soda and salt. In a large bowl, beat together the melted butter and sugars. Add in the egg, egg yolk and vanilla and mix until combined. Add the dry ingredients and mix until smooth and combined. Stir in the chocolate chips. In a small saucepan on low heat, melt together the caramels and cream, stirring until totally melted and smooth. Watch closely so it doesn’t burn! Remove from heat. Spread half the cookie dough in the bottom of the pan, pushing the dough up higher around the sides of the pan. This will keep the caramel from seeping out the sides. Fill the groove with the melted caramel, then sprinkle it lightly with sea salt. Cover the pan with the other half of the cookie dough. I like to flatten balls of it in my hand and lay them down evenly to cover any holes. Sprinkle the top of the bars lightly with sea salt. Bake the bars for 30 minutes or so, until the tops of the bars are lightly golden and the center is just starting to set. Let cool completely before cutting. I doubled the dough recipe for Thanksgiving and baked it in a 9×13 inch pan but I did not double the caramel. As you can see from the photos, they still had plenty. The caramel gets really oozy after cutting the bars which makes these messy so best to cut right before serving and store any leftovers in the fridge.